In one of my previous blogs, I’ve tackled two types of income people can have – active income versus passive income. As a short recap, active income is basically trading your time for money. Employees and self-employed people generally fall under this type. Without their active work, without their physical presence in the money-making work, no money comes in. As simple as that. But when money starts flowing into your pocket from something that doesn’t really require your physical presence, that just means you’re already earning passive income. (Good job!) Investments like in stocks fall into this category. In more specific terms, earning from investments is part of what’s called as portfolio income. Passive income basically rests on a “system working for you“. In investments, that system becomes money, so you have money working for you. As you may notice, passive income can be small at the start while you’re starting to build it up, but it can awesomely accumulate through time and may reach a point surpassing what your active income can offer. And that’s the beauty about passive income that I really like – the when the power of compounding starts to play. The rewards of my efforts need not be restricted to a limited time frame. Whatever passive income source I’d make now can be faithful my income source in the the coming years even if I decide to stop working on it. And as an engineering grafuate brainwashed to always think about efficiency, I believe creating and duplicating massive passive income sources is the most efficient way of building one’s wealth (and thus achieving one’s goals). That’s why I’ve also emphasized that it’s a lot better to have multiple sources of income. You should have not only a diversified investment portfolio but also diversified sources of income. When you do that, you position yourself to better improve your financial life. (You can read learn more in this blog – How to Increase Your Cashflow). But income is only one part of the equation. You’ve most probably heard a lot of stories about people earning big bucks but ended up miserably during their retirement years. Well, just like in any undertaking, you would need to see the bigger picture of your financial life. And that means coming up with your personal financial plan in support to the attainment of your financial goals. This financial plan will specifically assess how financially healthy (or unhealthy)! you are and give you a starting point to make your next course of actions. So if you don’t have one at this point, let me help you begin creating a draft of your financial roadmap (I got the outline from one of IMG’s module – Financial Planning & Goal Setting Workshop). 3. Estimating how much you should save to have enough passive income to sustain your chosen lifestyle when you can no longer earn active income. 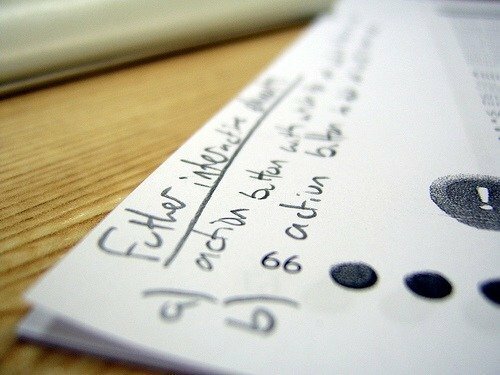 Only with an updated personal Statement of Assets and Liabilities (SAL) will you know exactly where you are financially. SAL is the listing of all your Assets and Liabilities to estimate your Net Worth. 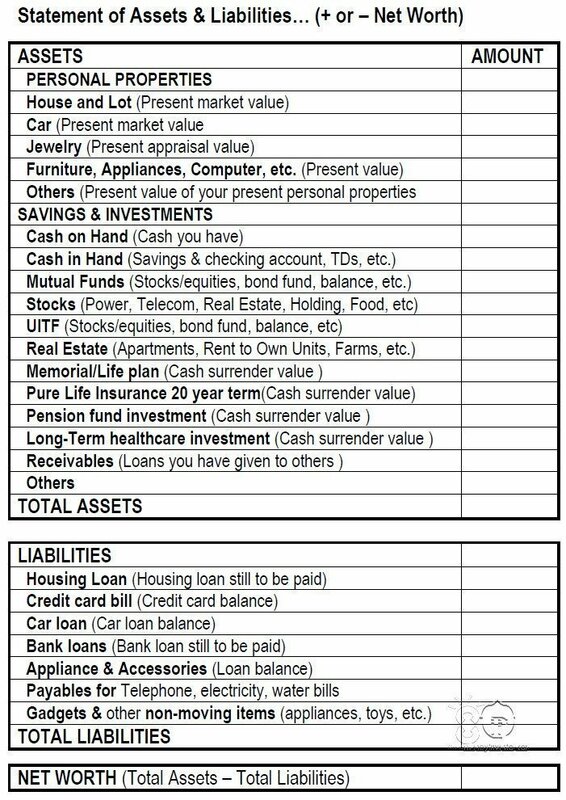 Assets minus Liabilities will give your Net Worth. Step 2: Make your Personal Income and Expenses Statement (PIES). 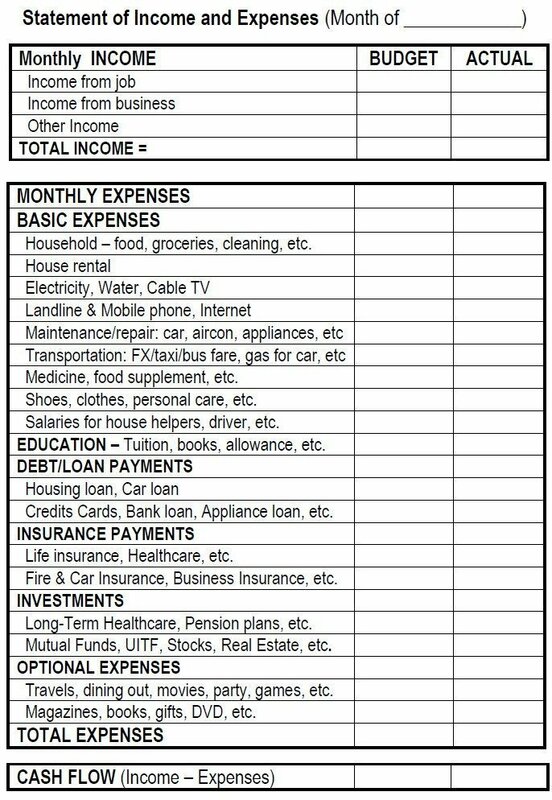 This is the listing of all your Income and your Expenses. Income minus expenses will give you your Cashflow. You should make one Cashflow statement below for each month. 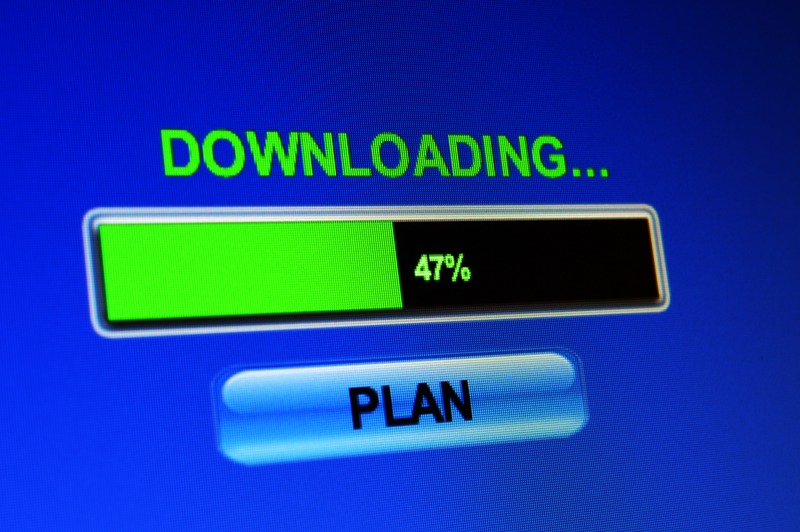 After knowing what you have now, the next thing to do is to have your goals and need analysis. (3.2) Know how to get what you want. NEEDS Analysis: What do you want? loan, car loan, credit card, etc.? 6. Own a decent house? 7. Own a nice car? 8. Travel and see the world? 9. Save enough capital for Business? 10. Donate to church and charity? How much can you afford to save each month at present? (Best effort)? How much do you need to save each month to reach your goal of P_______ M after ____ years? If you already made your personal financial plan, spend some time to review it to make sure you are still on the right track. If you have not done so, this is a good time to start. Only when you know where you are financially can you move forward to make your personal financial plan into a reality. Your personal financial plan will also keep you on the right track in making decisions on how much you should save and how you should invest from your savings. This plan is to be reviewed, if possible monthly, or at least twice a year. Early in the New Year is certainly a good time to make that review and the second time is about the middle of the year. You may also do it quarterly just like what companies do in their quarterly reports. People don’t plan to fail; they just fail to plan. When I was doing mine, I felt the truth that we’re really in charge of our lives. It just affirms that I am really the one creating my life. It actually made me face myself head-on and ask a lot of things and pushed me to think of ways on how to achieve the life I want. Quite scary yet liberating, haha. Wanna be one step closer to your dreams? Make your financial plan now. Have fun investing (with careful planning)! PS:Send me an email [pinoyinvesting@gmail.com] if you prefer to have a soft copy for the SAL and PIES templates above. PS2: The above post is inspired after International Marketing Group (IMG)’s Module 2 – Financial Planning & Goal Setting workshop. IMG also offers free basic seminars tackling topics like Practical Money Management & Creating Multiple Passive Income Stream. They offer it to general public for free. It’s basically their way of spreading financial literacy to everyone. As a financial products distributor company, it’s also their way of highlighting the importance of financial planning and investments. Email me – pinoyinvesting@gmail.com if you want to attend one. Or you can just sign-up here. The seminars can also help you refine whatever financial plan you make in the above exercise. They have various offices in and out of the country. You can bring your friends too if shy-type ka :). PS3: You can also join IMG and be its associate if you’d want to be your own financial advisor (thus saving yourself the product commissions) or just be an advocate of spreading financial literacy. I personally did because of the lots of trainings they offer to members. You can learn more here about its many benefits. But that’s going ahead of the story. Take the free seminars first if you haven’t attended one. Send me a quick note – pinoyinvesting@gmail.com. Or you can just sign-up here. What will happen if i invested 5,000.00 only for the period of let us 5 years? No additional amount with the duration. How much money will i get out of 5,000. Let us say the company has a good a good income? Use the formula of compounding FV= P(1+i)^t; the interest in stock market is estimated approximately equals to 12%. So your P5000 after 5 years would be approximately equal to P8800. Great stuff . . . got a huge amount of awareness from this blog..Thanks and God bless you Sir Omeng. Do You Want to Gain Financial Wealth and Spiritual Abundance at the Same Time? Join the Truly Rich Club headed by Bro. Bo Sanchez. Thank you Sir Omeng for this very useful article. I want to really thank you for the knowledge and information about investing you are sharing online.